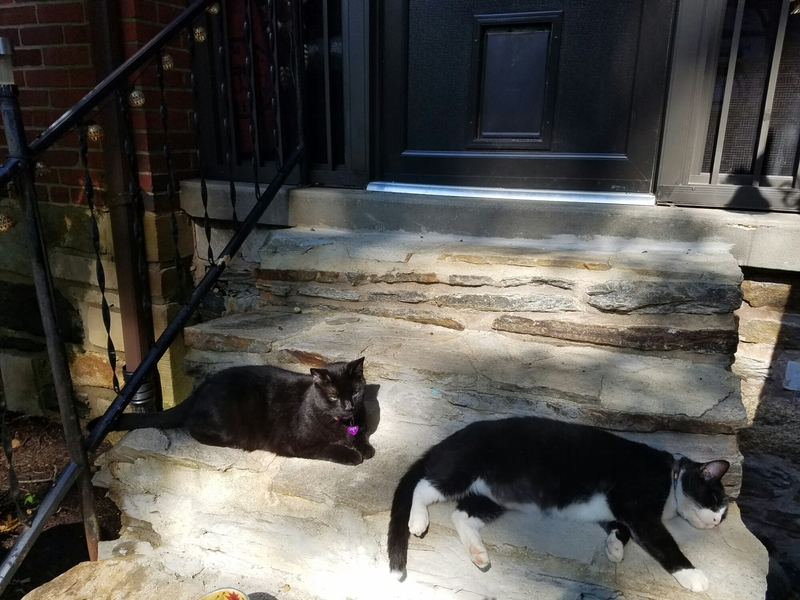 To maximize security, it is essential to have two Guard Cats on duty at any given time so that when one takes his nap break the other will remain vigilant to any and all threats to the Fort. That is until a chipmunk crosses the path and cat #2 takes off leaving a sleeping cat vulnerable to Woofie smooches. No chipmunks? So much fun. My sympathies. Good. The three cats here now feel better. They were collecting various critters to mail off to you. I sure wouldn’t attack that fort. doodz…with the both oh ewe guardin yur houz….knot even feerce ale ee ends wood dare ta pazz ~~~~~~~~~~☺☺☺♥♥♥ grate werk ! We are much too lazy to defend anything, but our Humans won’t let us go outside anyway so it’s their tough luck if anything bad happens. Cats bring such expression and joy when you really watch them. You are bringing them to life.